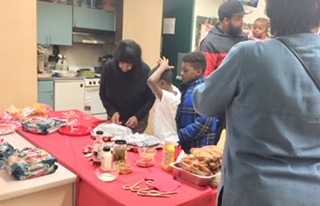 Community Members Celebrating Christmas at Dendy Recreation Center! 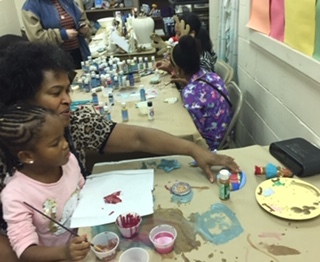 | Art Sphere, Inc.
Community Members Celebrating Christmas at Dendy Recreation Center! 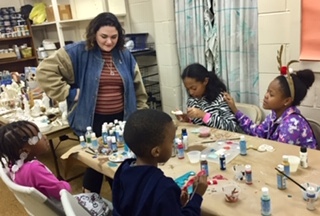 On December 21, 2018, adult students from Art Sphere Inc’s Thursday evening ceramic class shared their ceramic artwork and gave their extra pieces to local youth to celebrate Christmas at Dendy Recreation Center. 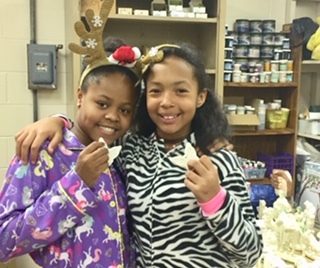 Our ceramics program helped bring adults to utilize the center and work with local youth. 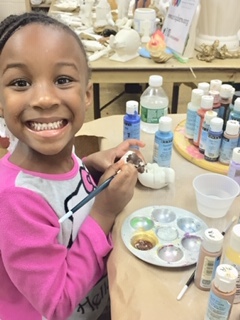 We hope community members will have had such a rewarding time making art with us and sharing their new skills with youth that they will attend future adult ceramics programs in the Spring, become members of the Dendy Advisory Committee and assist in ASI Summer art programing for youth. 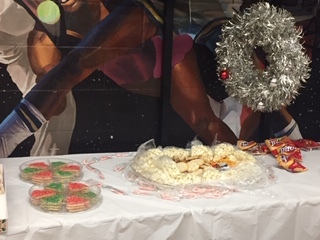 Art Sphere Inc staff helped decorate the center and the cinder block building was a transformed space: filled with people, tables and chairs, Christmas lights, a delicious dinner and deserts and even a Christmas tree! 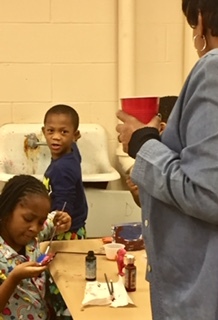 onding and art teaching as the children got to paint ornaments for their trees. 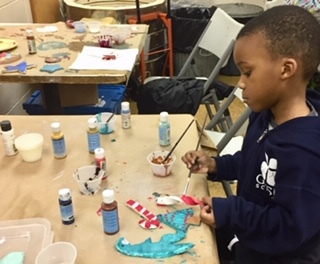 Children of all ages picked out their favorite adult made ceramic ornaments and painted them with acrylic paints so they could take them home with them at the end of party. 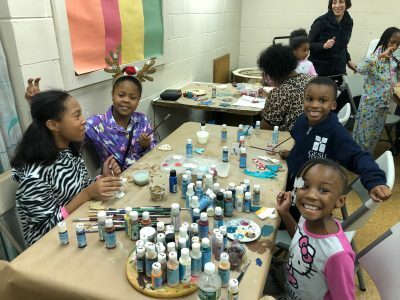 It was great to watch the wonderful community surrounding the playground come together, our adult artists share the art they made and give art through these handmade ornaments. 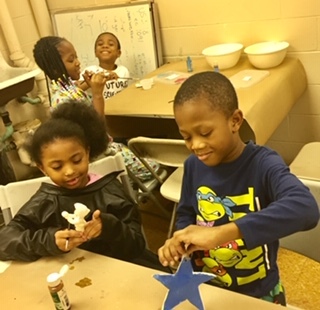 It was great knowing that these clay pieces would have a special place on the Christmas trees of local families and be childhood keepsakes. 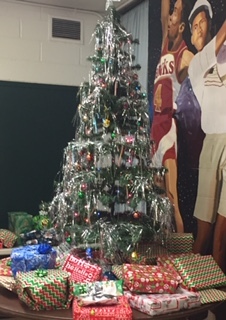 The community, center and Art Sphere Inc. made sure all of the children in attendance received several presents. 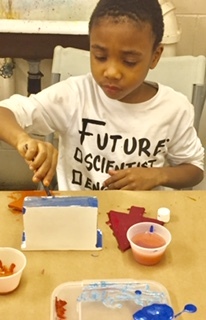 Art Sphere Inc. provided wrapped art boxes filled with art materials helping kids find creativity to take home under the tree as well. Everyone had a good time and lots to take home. 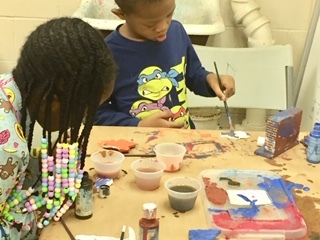 It was a wonderful party filled with love, laughter, and art. A perfect way to end the season! 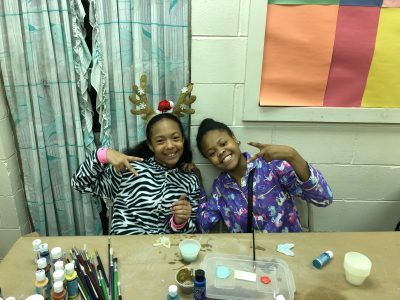 Share the post "Community Members Celebrating Christmas at Dendy Recreation Center!"